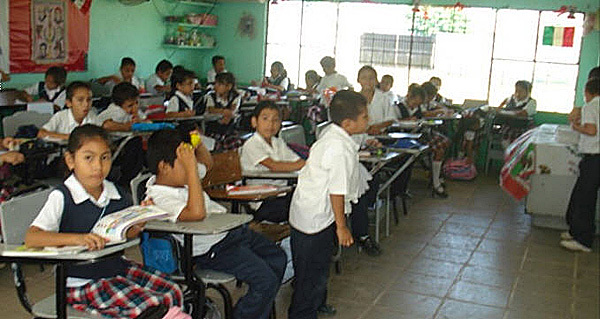 The Secretariat of Public Education (SEP) in Jalisco announced the implementation this year in Puerto Vallarta of the National English Program in Basic Education (PNIEB), part of the curriculum development in order that students of primary and secondary will gain knowledge that will allow them to communicate in a second language, which is very relevant since we are a tourist town. The Regional Directorate for Educational Services (Derse) headed by Professor Roberto Preciado Palomera reports that the overall purpose of the implementation is that the PNIEB students will learn various social practices of the language to enable meeting their communication needs and develop various strategies in learning while creating awareness in students about the existence of other cultures. The teaching of the English language, he explained, began 57 years ago in schools in the SEP at the secondary level, without favorable results since the courses do not have track records or generate enough interest in the students to follow despite its practical relevance. The government recognizes the importance of basic school education in learning English as a second language, so that graduating students are prepared to participate in the new global economy. Research shows that better results are obtained if the domain of English teaching begins in preschool or elementary school. The PNIEB is an initiative of the SEP whose overall objective is to implement the teaching of a second language: English from preschool to the 3rd grade. There are currently 21 state programs, which are varied by scheme and by seniority, within these highlighted programs which are recognized for their excellence and "best practices." It is intended that students will gain the necessary skills to participate in social practices of oral and written language, with native and non-native English by specific skills. The program contributes to cognitive development with reflection on strengthening the mother tongue and openness to other cultures. It develops skills for life and work. It is an agent of transformation, social mobility and seeks to articulate the levels of Basic Education regarding the English language in 4 cycles. PNIEB requires teachers specializing in English language and culture. There will be three classes per week with 50 minutes per group which will include language level certifications.